At the 11/16/2017 session of the Joint Medicaid Oversight Committee, the discussion circled around the Ohio BH Redesign. In particular, the beta testing dates, overall testing period and whether or not to date, the testing has been successful. During the meeting, due to multiple people requesting, testing has been extended to 12/15/2017. The next JMOC meeting is 12/14/2017 so it’s critical to have your agency’s test files in prior so they have an accurate representation of readiness. Several organizations including Lori Criss from Ohio Council, Emily Higgins from The Ohio Association of Health Plans and Molina as well as several agency’s provided testimony. The slides presented by ODM and OAHP are available here. Testimony submitted by providers are available here. Two slides presented by ODM caused significant conversation among committee members. 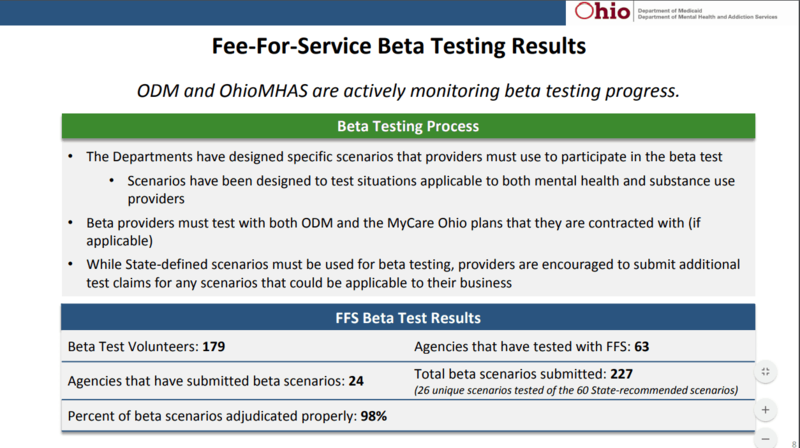 Essentially, the testing results to date for Beta testing/FFS and MyCare testing. The concern from many committee members was regarding the number of agency’s that have tested. 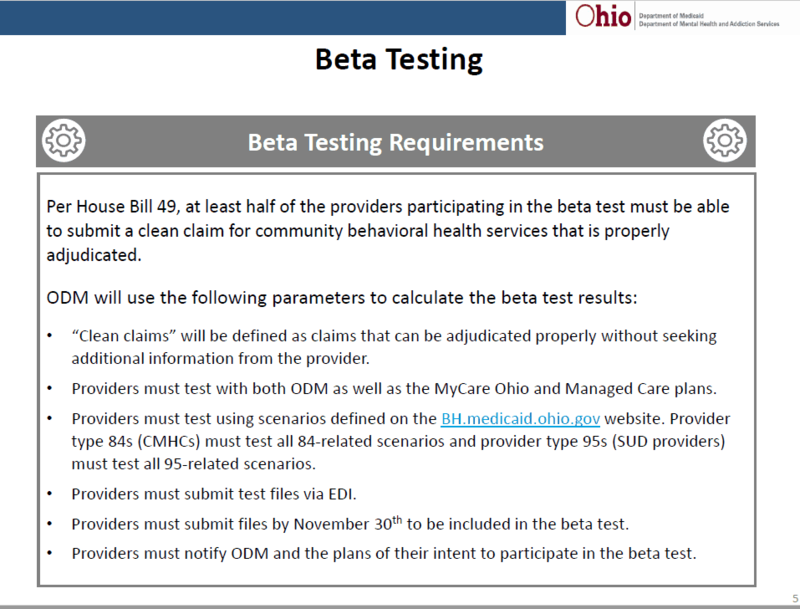 ODM is claiming successful testing, when to date out of 243 Beta Testers (as of 11/08/2017), only 24 had tested as of 11/13/2017 and that doesn’t include the overall agency’s in Ohio. One of my concerns was at both the EDI work group on 09/18 and the Readiness meeting in early October, we were told the way successful beta testing results would be calculated is on submission of one clean claim, as pictured below. When questioned about how the 98% reimbursement was calculated, Director Barbara Sears stated it was the total reimbursement of all submitted claims. I personally have tested and spoke to others who have sent test files that were unsuccessful due to various reasons. Where is the detail that demonstrates how the 98% reimbursement rate of files submitted was calculated? No detailed information on total files submitted and passed or failed or specific information on total dollars submitted and reimbursed was provided. One file I submitted totally denied but adjudicated, due to provider NPI. It was an error that is easily fixed. This was for a beta tester of beta scenario’s. Another file I submitted had 5 claims out of 35 pay because the functionality related to adding the modifiers broke over the weekend. In reality, according to documented information, if that was a beta testing submission, it would have been counted as successful. Since then I have submitted additional, corrected files. One today, also a beta tester, came back at 14% reimbursement. Lesson learned, review each and every file in a good text editor prior to sending. EMS Healthcare Informatics offers a line of tools that make it very easy for me to read, interpret and determine errors with a file before and after it is sent. They also allow for you to read your 277 Claims Response files and 835 Payment files. IF you aren’t reviewing both, you may never know exactly why your claim failed. You can also use their 270 Power Generator to send a batch 270 eligibility report to verify eligibility through 09/01/2017 – 11/30/2017 and isolate your MyCare clients for testing. Here’s a link where you can get more information about their products. Two people from agency’s testifying at JMOC yesterday are beta testers and have submitted files that either failed or claims denied. I talked to two more agency’s today that have tested with similar results. If these failures or denials are occurring from people I heard from first-hand, where does their testing factor into the overall reimbursement percentage reported by the state? We need detail on the test files, beta or FFS. What’s the total pass/fail percentage? What’s the overall reimbursement percentage of files that passed? 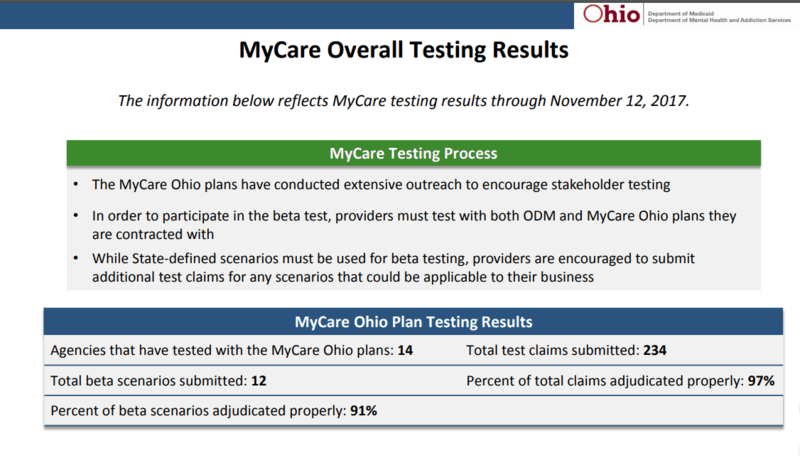 Without that detailed info in combination with such a low volume of testers, how can we risk putting access to care in Ohio in jeopardy?